Do you need computer lessons for beginners? TechnoPainter has activities that will help your students develop their skills. Teach the fundamentals in a FUN way! Each activity in TechnoPainter uses Microsoft Paint. This program is part of the Windows operating system. There is a product version for Windows 7 users , as well as for Windows XP and Vista users. 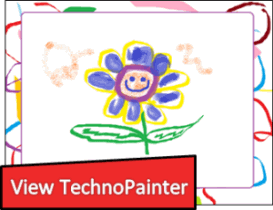 UPDATE: TechnoKids has updated TechnoPainter for Windows 10. There are no longer versions available for older operating systems. The instructions are step by step, making them easy to follow. Your students gradually become experts at using digital art tools to create. Each session introduces a new set of tools, which offers your students the opportunity to build upon their increasing computer knowledge and abilities. Your students need to know the basics! The activities in TechnoPainter will help your students to develop terminology, keyboarding skills, and mouse control. In addition, they will learn how to maneuver in a Windows environment, open and close a program, and file management skills such as how to open, close, save, and print a picture. The activities are perfect for students in Grade 1 and Grade 2. What types of art activities will your students complete? Your students will create coloring book pages, paint a rainbow, produce a geometric design, make a frame, complete an award, and more! Included with TechnoPainter are review questions designed to help students learn the function of tools. As well, there are skill reviews that provide students with an opportunity to practice their newly acquired skills. In addition, extension activities are included to challenge advanced learners. Templates are also included with TechnoPainter. Templates provide a starting point for beginners to hone their skills. For example, the Coloring Pages templates are a collection of black and white pictures students can paint. The Edit It templates are a series of unfinished pictures that require students to apply their skills to complete. The Finish It template provides step by step instructions to have students practice their digital painting techniques. The Magnify It template gives students an opportunity to zoom in and out to edit a picture to improve the appearance. And there are even more templates included with TechnoPainter to help your students develop their computer skills. TechnoPainter is a great way to start off your school year. The activities in TechnoPainter provide a foundation for future learning. Learn more about TechnoPainter.